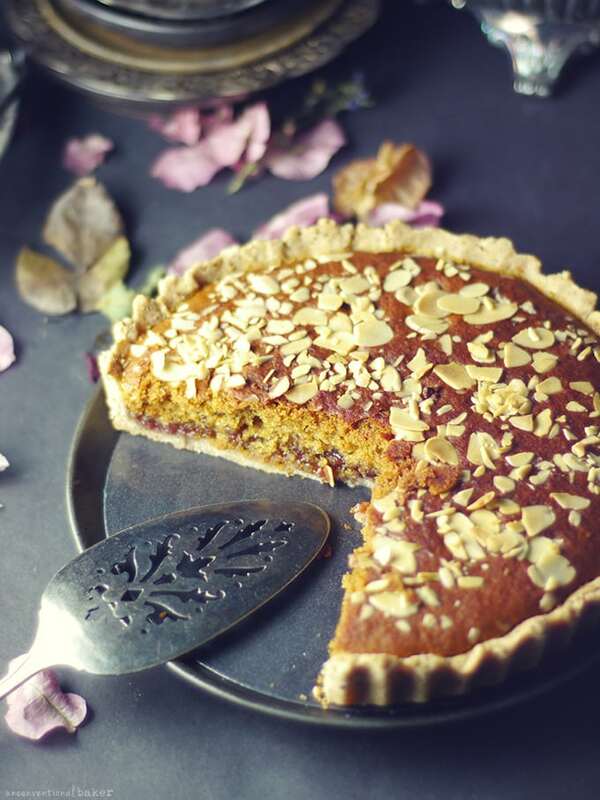 Before we get to the tart though, I wanted to share my experience cooking from her new book. 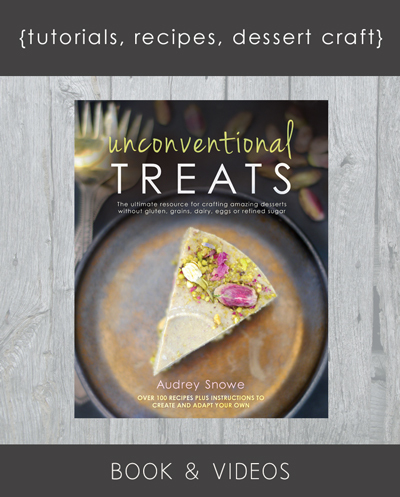 As you’ve seen recently, my own cookbook is nearly here (at least the ebook version is inches away from being released, and that’s a start! :)), and it’s been an immense labor from beginning to end — something I’ve been working on for nearly a year now. You have no idea how many hats you have to wear when you do it all yourself for something like this. In the process, when I found out Trinity was working on her own next book, I couldn’t have been more excited for her. And when it finally came out, I sprinted to order my copy. Going through the process of creating a book myself, I knew just how much effort, care, and dedication Trinity has put into it and I wanted to support her work wholeheartedly. Can you see how alive the food is in all these recipes? 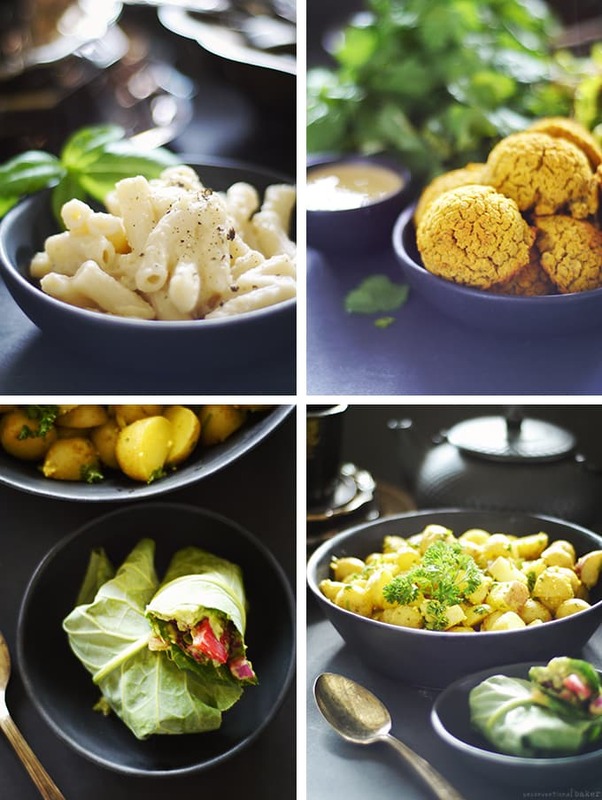 :) Top left is her creamy cauliflower sauce — possibly my favorite light version of a white pasta sauce to date, and one we’ve already made several times. Top right is her baked sweet potato falafels — I used a hack method of making them with a cookie scoop instead of rolling by hand to save time — learned something new :). Bottom left are her wellness wraps — I used collard greens to make mine — the last from my garden — even though the original recipe called for kale leaves, and I loved it so. Bottom right was my favorite potato salad ever with a most beautiful cumin flavor. I think the things I loved making the most from her recipes though are all the patties and burgers — something I haven’t been making nearly enough until now. 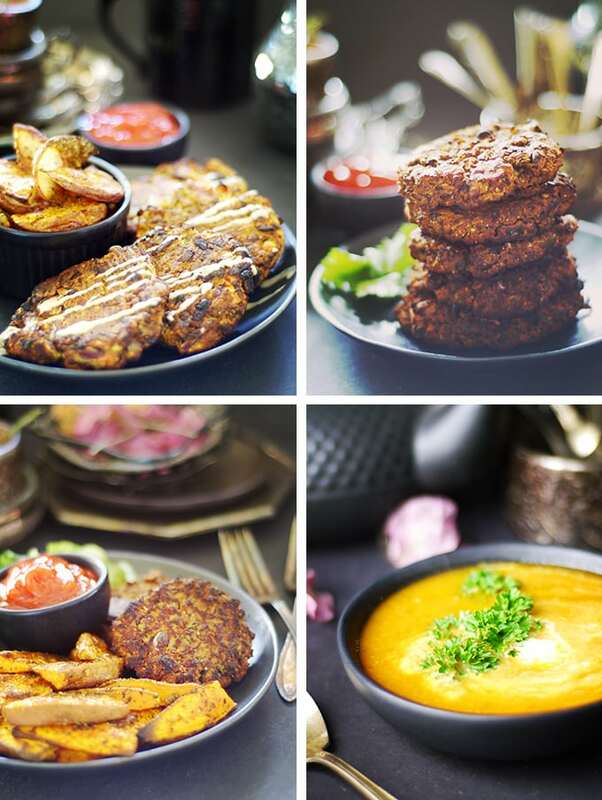 Top left are her chickpea burgers. Top right are the real star of the show — my absolute favorite thing from the book — black bean burgers. They’re so good they even got my mushroom-averse husband to enjoy something with mushrooms — a very rare thing, to be sure, and definitely not something I’ve succeeded with before… (thanks Trinity! :) ). 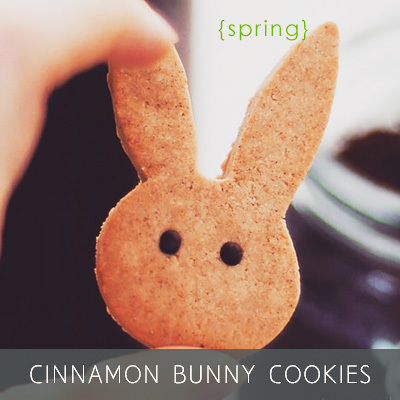 They are definitely one of those things to be made on repeat over here — in fact, I’m making more tomorrow. Bottom left are more of those black bean patties with a side of Trinity-style sweet potato fries. And the bottom right is my favorite butternut squash soup EVER. And I make a lot of butternut squash soups :) — she put roasted cashews in it and it’s a delicious thing. 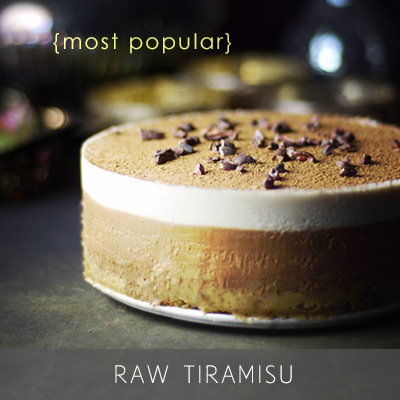 By the way, I showcased the savory things only here, but there are plenty of incredible sweets in this book as well — like raw slices, cakes, chocolate, and more. I wish I could show you the many more amazing things we enjoyed, but I don’t want to keep you from that Bakewell tart much longer. I’ll just leave you with my final thoughts on this book — if you’re into super simple, but wholesome, easily customizable, and healthy meal recipes, I think you’ll absolutely love it. You can get your own copy from Trinity’s website in print here or as an ebook here. 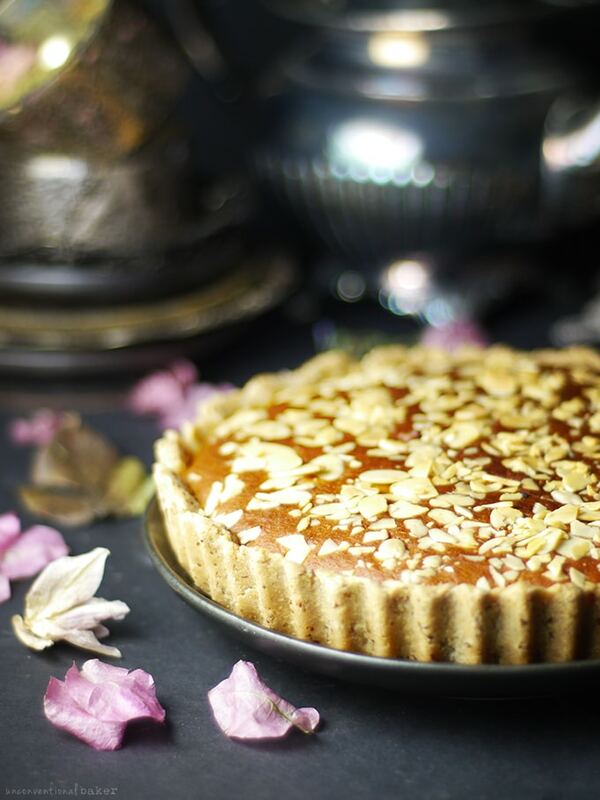 So in case you’re not familiar with a Bakewell tart, it’s basically a shortbread-type crust pastry, filled with a fruit spread (store-bought or homemade), and topped with an almond-infused sponge cake. Delicious as you might expect! A gluten-free pastry with a shortbread style crust, filled with fruit jam and almond-infused sponge cake. 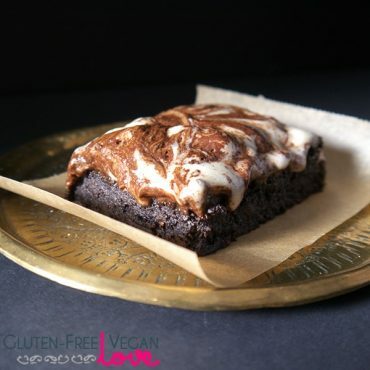 Vegan and refined-sugar free. A few heaped dessertspoons of sugar-free fruit spread (I took the easy route and stole some of my husband’s St. Dalfour fruit-sweetened raspberry jam. 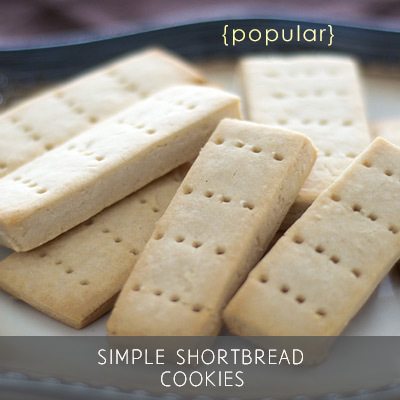 A homemade version, like this recipe, will work great too). Pastry base: Oil a 10″ tart dish and set aside. Briefly mix the rice flour, tapioca flour and ground flaxseeds together in a bowl. Add the coconut oil (melt first), rice syrup and vanilla. Mix with a spoon. Once it has started to combine together nicely, use your hands to knead and press it all together until you have one large ball of pastry (if it’s cold, the warmth of your hands will soften the dough and make it pliable). Flatten the dough into a disk (or roll out a little if you prefer), and place in the prepared tart pan. Use your hands to “massage” the dough and shape it into a tart shell, evening out any gaps or cracks as needed. When done, put the tart pan in the fridge while working on the next step. Cake topping: Preheat oven to 350F (or gas mark 4). Mix all dry topping ingredients together in a mixing bowl. Mix all the wet ingredients in a jug. Pour the wet ingredients into the mixing bowl and thoroughly mix in with the dry (a bit of a “fizz” is normal at this stage). Assembly: Take the tart pan out of the fridge. Spread an even layer of fruit jam over the base of the tart crust. Pour the cake mixture into the pastry base over the fruit spread (or spoon it on top if it turns a little thick if it’s cold in your kitchen). (I topped mine with some sliced almonds at this point). Baking: bake for 35 minutes in a pre-heated oven. Remove and cool on a wire rack completely so as to avoid crumbling. Enjoy! Hey Rachel — thank you! And of course I already said it in the review, but I definitely recommend the book. I have it in print & online and I love both versions. 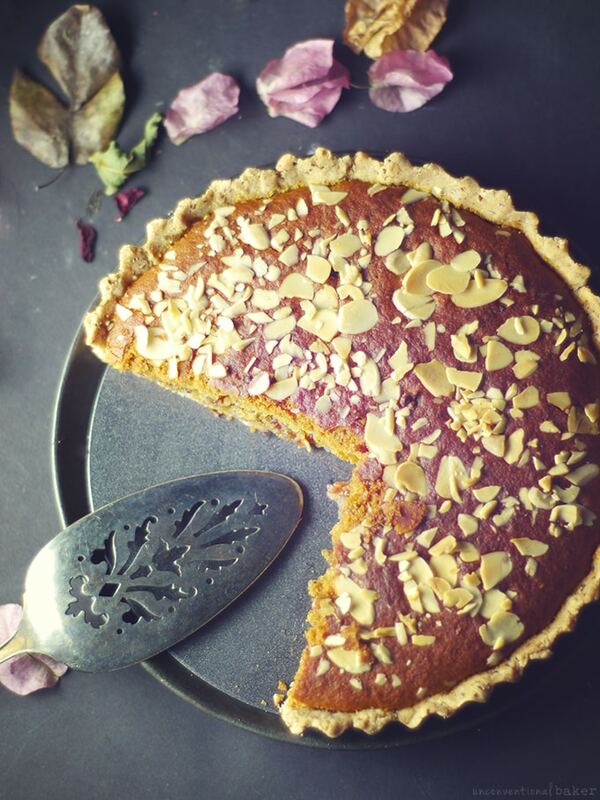 This bakewell tart looks amazing! Even better than the traditional kind!!! I love this write up of Trinity’s book, Audrey. All of her recipes sound amazing. I love her blog too, so I definitely need to buy her book. Love that you used St Dalfour jam too – their spreads are delicious! And totally agree about Trinity’s blog & recipes! Highly recommend the book even if just to experience a new way to approach familiar recipes through another’s lens. Well that just looks delish! I’ve never heard of a bakewell tart! I don’t blame you — I’ve never heard of it either until I started looking through some UK recipes! Wow, some amazing looking recipes there! Trinity has such beautiful recipes and they always look delicious!! Looks like a beautiful book! Love all the almonds used in this recipe! 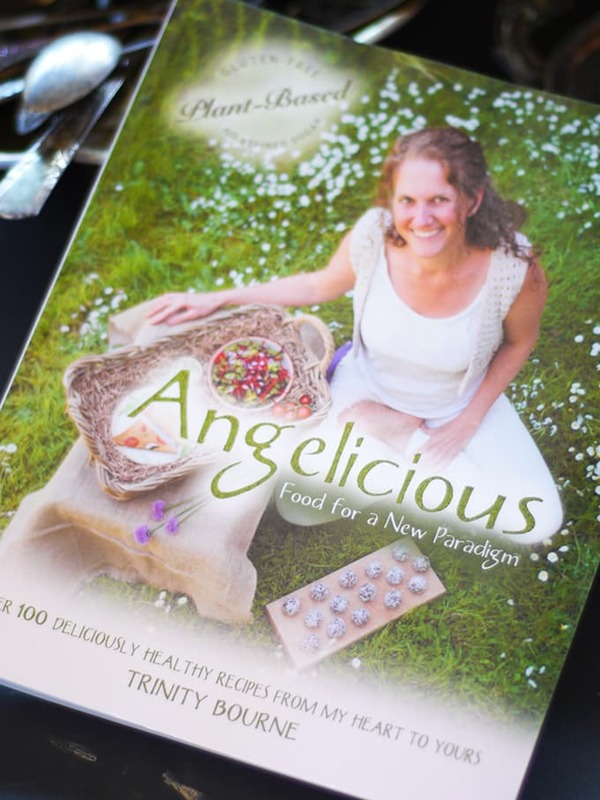 I have been a fan of Trinity’s cooking for some time now – actually, she helped me make the leap from being vegetarian to being vegan. 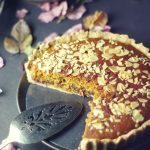 The ingredients for this delicious Bakewell Tart are on my kitchen counter – including rice syrup and not agave!! Thanks for posting this Audrey – love the pics!!! Hi Cynthia — so sorry for the super delayed replay here. Just wanted to say thank you for your lovely comment. Trinity’s recipes are amazing — so simple and easy to follow, and full of care too. I hope you enjoyed the tart! 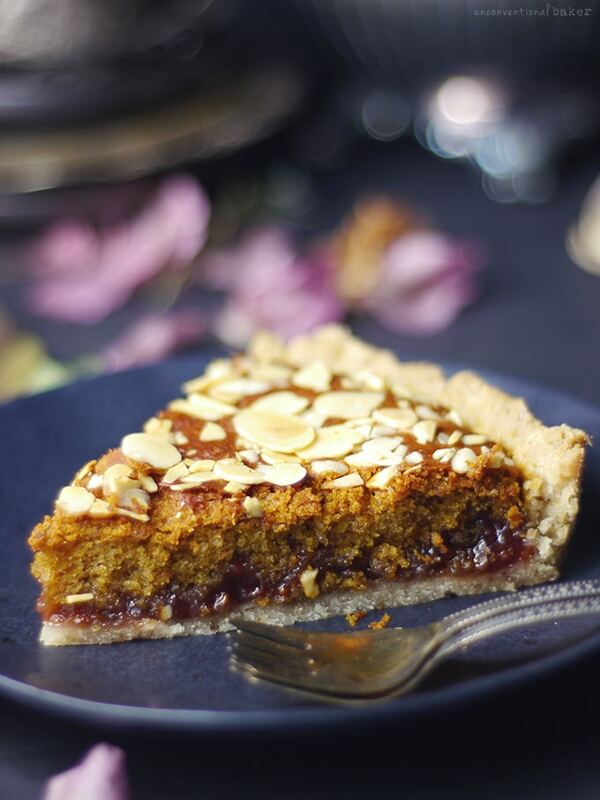 How fantastic – I love bakewell tart so this made over recipe is very welcome! I am over-joyed to know that my book Angelicious inspired you so! 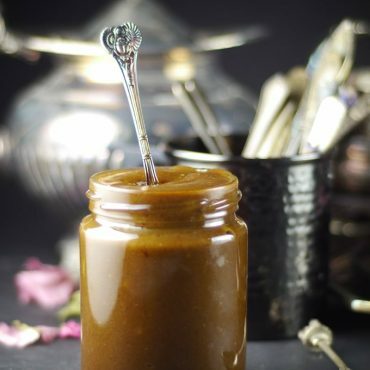 You are my favourite food photographer, with a dreamy style that makes my heart sing – so I am absolutely delighted to see your photos of some of the Angelicious recipes. With heartful thanks!